New formulation for powerful, low-foaming cleaning of sealed wooden floors. For use with auto scrubber or conventional cleaning methods. pH neutral detergent which leaves no residue. 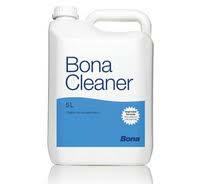 A product which is designed with an easy daily use in mind, the Bona Cleaner, regardless of the size of the bottle will certainly assist you in terms of maintaining that much loved wooden surface. Leaving no dulling residue, this specially formulated product will see your floor maintain the shine and sheen which made it such a desirable product in the first place. Easy to use in accordance with an auto scrubber or traditional cleaning methods, this is a product which is aimed at those of you who are looking to keep that new look for as long as possible.